El Solar del Cid was built in 1784 by José Cortés. 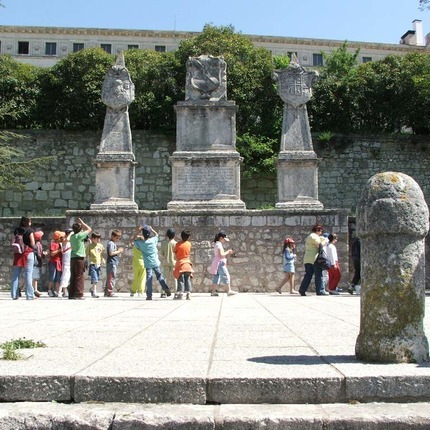 Although there is no historical evidence, this site, which was later transferred to the monastery of San Pedro de Cardeña, is said to mark the place where the house of El Cid was located. 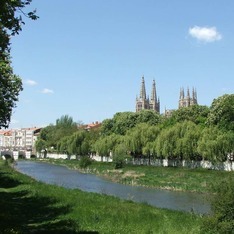 The site has tile flooring and the monument consists of three monoliths that stand erect on a pedestal and that bear the shields of Burgos and San Pedro de Cardeña. In the middle there is a commemorative plaque bearing the coat of arms of El Cid. It is very likely that the site in which the El Solar del Cid is placed was part of the Jewish quarter during the 13th century, so that this would also be the place in which the “Rachel and Vidas” episode in El Cantar de Mío Cid took place. According to El Cantar, el Cid calls Martín Antolínez and explains his plan to get money for his mission from Rachel and Vidas by deceiving them with two chests of sand.